Oren Harman’s book about the life of George Price , The Price of Altruism: George Price and the Search for the Origins of Kindness, has been reviewed by W. F. Bynum (gated) in Nature and Frans de Waal in the New York Times and I also enjoyed reading it lately. Harman tells a good story by building a “double helix-like structure” as he calls it for the book – alternating episodes in the ultimately tragic story of Price’s life with those in theorizing about social relationships in evolutionary biology from Darwin to the present – with both set in the context of their times. Part I of the book largely deals with Price’s life prior to his coming from America to London in 1967 and with the scientific story from Kropotkin and Huxley, to Fisher, Haldane and Wright, to Allee and Emerson, to Wynne-Edwards and George Williams with the development of game theory in the background. Even the moderately well informed are likely to learn some things from this. For example I was surprised to learn that Kropotkin’s Mutual Aid was originally written in the form of five essays responding to one of Huxley’s on “the struggle for existence”. I was also surprised to learn (or had forgotten) that r, the famous coefficient of relatedness in Hamilton’s inclusive fitness equation, was originally derived by Wright, although he did not use it to explain altruism. Part II deals with Price’s life and work in London including the derivation of the famous Price covariance equation until his death in 1975 and with his relations with John Maynard Smith and Bill Hamilton. Harman’s shoehorning the general problem of the evolution of social cooperation and conflict into that of altruism is a bit of a squeeze, but given the undoubtedly important role the latter eventually played in the story of the former, and given Price’s lonely suicide after a period of “living rough” while trying to live up to his new found Christian ideal of selfless altruism – the author’s succumbing to that temptation is very understandable. We will never know the cause of Price’s tragic suicide. The author tentatively suggests he suffered from the fashionable Asperger’s syndrome (he had a restless and rather unstable personal and employment history). There was an unrequited love. A psychiatrist who saw him not long before his death raised the possibility of schizophrenia (late in life he apparently had fairly frequent communications with God as had his mother). To top if off, his severe hypothyroidism and cessation of medication for it could have resulted not only in depression, but also (albeit rarely) in psychotic hallucinations. 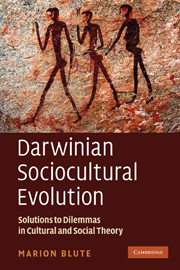 The scientific story is brought pretty well up to date by Harman with the inclusion of Samir Okasha’s contextual analysis or cross-level byproducts approach (essentially multiple regression) to multilevel selection and Benjamin Kerr and Peter Godfrey-Smith’s (gated) more general version of the Price equation which symmetrically permits descendants without ancestors such as migrants for example as well as ancestors without descendants in a population (see also Godfrey-Smith). This appears to be one of those beautiful developments which are classic in the history of science and Harman is surely right that Price would have enjoyed it. Anyone interested in the history of evolutionary theory or in science studies (the author suggests most of the main protagonists were ideologically motivated) will enjoy this book. Indeed anyone even with little or no prior knowledge but curious about one of the big questions in the history of ideas should as well.